Settle into this sumptuous sectional and enjoy the views from the floor to ceiling windows. Bright open floor plan allow everyone to be part of the conversation Eat-in kitchen with plenty of storage and counter top space. Reflections of granduer. You just can beat these views Cuddle up in luxury linens and enjoy a peaceful nights rest on our hand crafted mattress. The master bathroom is surprisingly spacious, and so bright. There is plenty of storage in the vanity, and in the built-in shelving. Bath time should be a retreat from a busy life, and that is just what you will feel living at Ovation. Complimentary William Roam bath amenities, inspired by travels of the US. As Tysons Corner’s first luxury high rise, Ovation at Park Crest is a true gem boasting resort style amenities and world class service. As the preferred furnished accommodations provider, Dwel offers a mix of well-appointed 1 and 2 bedroom serviced apartment residences – each one unique in its own way. 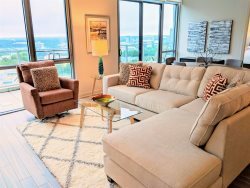 This elegantly appointed 2-bedroom, 2-bathroom corner apartment is located on the 17th floor and benefits from natural light shining through the floor-to-ceiling windows. Settle into the sumptuous sectional to watch your favorite TV show or just take in the stunning views of Tyson and points West. This is a good as it gets. Ovation is perfectly situated in the heart of Tysons close to all major headquarters and world class shopping at Tysons Galleria. Need a late night snack? Simply walk over to the 24-hour Harris Teeter grocery store and Starbucks that’s located on the property. Transportation is a breeze from Ovation. The new Silver Line Metro is minutes away which will zip you to downtown DC in 20 minutes. And you have easy access to all the major thoroughfares – I495, Dulles Toll Road and I66. Come experience Dwel @ Ovation and discover how we’re taking the “corporate” out of corporate housing. Beds feature luxury linens and Klever's proprietary mattress handcrafted in VA. It's pretty simple really. All we ask is that you treat this apartment and our furnishings as if you owned them and respect the building residents and staff. Since this is a LEED certified building, there is no smoking in the apartment or on any part of the property. Parking is available in the underground secured garage with direct elevator access. $5 per night, per car. Electric charging spots are available on a first come, first served basis. We love pets and are pet owners ourselves. In some cases, there are restrictions based on weight and in almost all cases there are restrictions for aggressive breeds. Let us know what type of pet you have and we can provide all the details. Pet fees include a $500 non-refundable deposit and $3/night pet rent charge. As Tysons Corner's first high rise apartment building, Ovation at Park Crest is a true gem boasting resort style amenities and world class service. You'll be hard pressed to find another community that offers the balance of convenience, comfort and style as Ovation. As the preferred furnished accommodations provider, Dwel offers a mix of well-appointed 1 and 2 bedroom serviced apartment residences in keeping with the Ovation standard. Like Ovation, each of our residences are unique.